Woodchuck Hard Cider continues its tradition of category pioneering ciders with the release of Woodchuck Cellar Series C hocolate. The third cider released in the Cellar Series line, Chocolate is on store shelves now, just in time for Valentine’s Day. 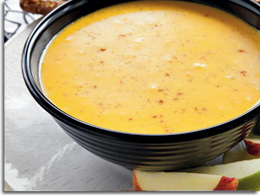 Woodchuck’s original small batch hard cider, featuring Vermont culinary apple varieties such as Macintosh and late season Northern Spy, was aged with crushed cocao beans. Cocao beans, or nibs, are the starting point from which chocolate is produced. The infusion of the cocao nibs brings notes of artisan chocolate throughout the nose and taste of the cider. 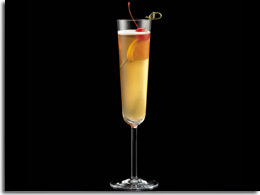 A hint of caramel accompanies the dry finish, as does a full apple flavor. Cellar Series Chocolate represents one of the most unique ciders Woodchuck has ever brought to market. It deepens the commitment to crafting cider styles that push the category forward while exposing cider to an ever-growing audience. Cellar Series Chocolate is pasteurized and featured in a 22oz bottle. Alcohol by volume (ABV) is 6.9%. It is shipping now nationwide and will be on store shelves through February. Suggested retail for a 22oz bottle is $4.99. For more information on Cellar Series Chocolate and all things Woodchuck visit their blog, The Core. Looking to find it near you? Check out the Woodchuck Cider Locator. SBS Imports and the Seattle Beer Collective are pleased to announce the return of their successful Cider Summit Chicago. This year’s event will take place on Saturday, February 8, 2014 in two sessions – 11am-3pm and 4pm-8pm – at the Navy Pier’s Lakeview Terrace Room. Cidery owners and cidermakers will be on hand to inform and guide guests through the over 100 cider samplings from 36 producers which will be available in 4-ounce portions. Cider Summit will feature ciders from throughout the US, England, Scotland, France, Spain and even New Zealand. The event will also feature specially selected food pairings, an author’s corner, and an event store featuring Cider Summit t-shirts and other merchandise. Tickets are $25 in advance and $30 at the door (if tickets remain; cash only). Tickets can be purchased online at CiderSummit.com and at the Hotel Palomar concierge desk. Admission includes a souvenir tasting glass and eight tasting tickets. Additional tasting tickets will be available for sale onsite at $2 per ticket. Designated driver tickets are also available for $5 and include a bottle of water. A separate ticket is required for each session. The event is 21 and over only. Cider Summit Chicago will benefit The Great Lakes Cider & Perry Association and Heartland Alliance. To purchase your tickets and find additional information, please visit CiderSummit.com. The event is being presented by Binny’s Beverage Depot, along with supporting sponsors World of Beer Naperville, Hotel Palomar, Chicago Brew Bus and River North Sales & Service. Earlier this month, Stella Artois announced Stella Artois Cidre, the crisp, dry European-style cider lau nched to widespread acclaim in May 2013, is launching nationwide. As a long-time supporter of cinema and the Sundance Film Festival, Stella Artois Cidre is using the festival's gorgeous wintry backdrop to host a series of occasions showcasing the versatility that has driven Stella Artois Cidre's success. In May 2013, Stella Artois Cidre was introduced in 26 states. Since then, the increasingly popular beverage has been an important part of a surging US cider market—which is growing more than 100 percent annually. Stella Artois Cidre will now be available in all 50 states. It will also now be available on draught in bars and restaurants nationwide. "When we launched Stella Artois Cidre, we saw that the cider market in the US was poised for continued growth," said Chris Hanson of Stella Artois. "White wine drinkers in particular have been drawn to Stella Artois Cidre. So, we have decided to expand the Stella Artois Cidre footprint both on shelves and on tap, and where better to celebrate than in the crisp mountain air of the Sundance Film Festival?" To commemorate this expansion, Stella Artois is hosting a range of events at Sundance, including a launch party that took place last Friday (January 17), that featured a surprise performance from an acclaimed musical guest amidst a chic "winter orchard" setting in the Stella Artois Cidre Lodge. Additionally, actress Elizabeth Banks of Hunger Games fame joined the festivities as a special guest, to toast the success of Stella Artois Cidre. Throughout Sundance, Stella Artois Cidre will also host food tastings and private dinners as the food-pairing versatility of a crisp, complex cider such as Stella Artois Cidre is one reason the brand has surged in popularity since its launch. 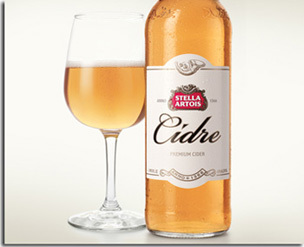 Stella Artois Cidre is distinct from cider competitors in many ways. It is a crisp European-style cider made with apples hand-picked in wine-growing regions in the Americas. It is a sophisticated cider, drier than many of the sweet domestic brands that occupy American shelves. As such, Stella Artois Cidre is served in a white wine glass, and pairs well with chicken, fish and a broad selection of cheeses, including Camembert-style cheeses, English cheddars, semi-firm cheeses such as Gruyere and washed-rind cheeses. Stella Artois Cidre's tart profile also balances well with Asian and spicy foods and light salads. At 4.5 percent alcohol by volume, Stella Artois Cidre is available in two packaging configurations: four-packs of 12-ounce bottles and single, 24-ounce bottles. As noted, Stella Artois Cidre will also be available on draught. For more information, please visit StellaArtois.com. With the cold winter season in full force comes the flu, colds, allergies and sore throats. Luckily for you, we found an awesome health tonic to relieve many cold season ailments. Its name: Fire Cider. Its purpose: cure-all. Fire Cider is made by family run Shire City Herbals in Pittsfield, Massachusetts, and was incorporated in 2011 by Dana St. Pierre, a certified yoga instructor and Reiki master, along with his wife Amy Huebner, a holistic health coach, Amy’s brother Brian, a comic artist, Dana’s sister Erin, and Amy and Brian’s father Dr. James Huebner. Dana, Amy and Brian spend a day every week producing Fire Cider at the Community Development Kitchen in Greenfield (MA) and take turns attending festivals throughout the country. The first batches of Fire Cider were created when Dana began making early versions in the 90’s to combat his yearly bronchitis and seasonal allergies. Throughout the years, he perfected the recipe to what it is today. Fire Cider was first sampled at an annual Handmade Holiday Festival and when they sold out, they realized they had something special. Fire Cider hit stores in September of 2011 and can now be found across the United States in approximately 100 retail locations in over 20 states. So what exactly is Fire Cider? According to their website, “The base is raw, Certified Organic apple cider vinegar and raw wildflower honey. Then they add: organic oranges, lemons, onions, ginger, horseradish, garlic, turmeric, and habanero pepper.” Fire Cider is naturally gluten-free and has a long history of safe and effective use in herbal healing traditions. It can be used to fight a cold or the flu, strep throat, seasonal allergies, sinus relief, heartburn, and hangovers. It has also been used as a digestive aid, for vocal health, and to stay awake with out coffee. Worried about the taste? It is delicious but Fire Cider easily mixes well with lemonade, orange juice, tea, and more so it can be added as a supplement to a typical daily beverage. However, since the tonic contains horseradish and habanero pepper, it can be spicy to some dependent upon your tolerance to spice/heat. As if you don’t have enough reasons to love Fire Cider already, the company is committed to sustainability and earth friendly packaging. Not only is Fire Cider organic, but the bottles and caps are recyclable too. Fire Cider also uses recyclable, and sometimes recycled, cardboard boxes and wrapping paper to ship product to wholesale and retail customers, as well as packing peanuts made from food starch. The labels, which are designed by Brian, are also earth friendly. 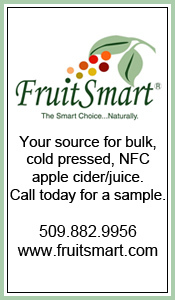 This is a company that truly started from the ground up and has family roots that are as organic as their ingredients. Fire Cider retails at $12 for 8-ounces, $22 for 16-ounces, $65 for a half gallon, and $120 for a gallon. On the Fire Cider website, you can also purchase a cook book for recipes utilizing Fire Cider and an easy-to-use shot glass with measurements that read: daily dose, cold coming on, cure hangover, cure boredom, and repel wolves. 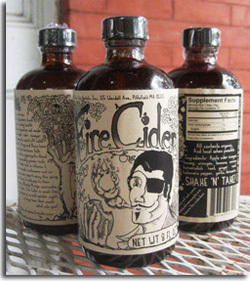 To purchase Fire Cider, find a retail location near you or obtain more information, please visit FireCider.com. 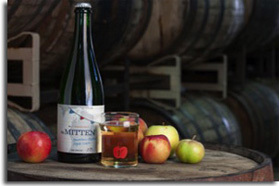 Virtue Cider has re leased a 2013 vintage of its popular winter cider, The Mitten. A blend of last season’s best Michigan apples, The Mitten is aged for several months in bourbon barrels, then finished with juice from the prolific 2013 apple harvest. The resulting cider offers notes of vanilla, caramel and charred American oak, balanced with the best of the orchard – over-ripe apples and their sweet, tart, earthy juice. 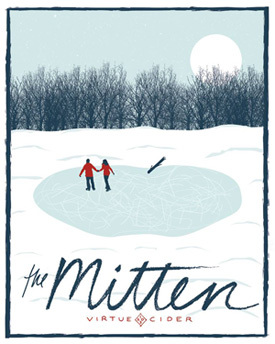 This is the second draft release of The Mitten and its first bottle release outside of Virtue’s Fennville, Michigan tasting room and bottle shop. The Mitten 2013 vintage enters the craft cider market already a recipient of the Gold Medal Award for Cider at the 2013 Festival of Barrel Aged Beer. It is one of six traditional farmhouse blends Virtue Cider ages in one of the largest barrel programs in North American cider. The Mitten will be offered on draft and in 750mL bottles in all markets where Virtue is currently distributed, including the company’s home state of Michigan, plus Chicago (IL), Kentucky, Los Angeles (CA), New York City (NY), Ohio, Portland (OR), San Francisco (CA) and Washington. It’s also available to order online. Learn more about Virtue Cider online at VirtueCider.com. Every year Forbes announces a listing of innov ators and entrepreneurs who are under the age of 30 and eager to change the world. Featuring 15 categories ranging from technology to education to social media and applications, Forbes editors and reporters work with panels of expert judges to choose the field’s brightest under the age of 30. These people represent the most intellectual and creative entrepreneurs of their generation and are all engaging and hardworking individuals. Forbes’ “30 Under 30” list has a great track record in picking tomorrow’s stars. Past lists have included stars like Lady Gaga and Adele to billionaires such as Bill Gates and Mark Zuckerburg. 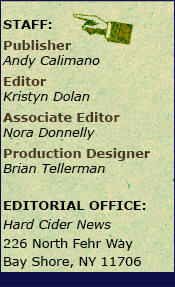 This year, the list includes hard cider industry stars of Downeast Cider House. Tyler Mosher, Co-Founder of Downeast Cider House remains humble about this recognition, saying, "Making the “30 Under 30” list has been a nice validation for what we've done to this point but we'd like to be doing this past the age of 30. It serves as more of a reminder for where we want to go, not what we've done." 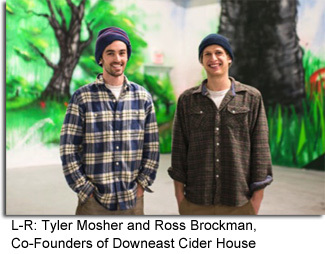 Downeast Cider House was founded in 2011 by Tyler Mosher and Ross Brockman with inspiration from Tyler’s Father. Tyler’s Father knew that the two men didn’t exactly know what they wanted to do when they were finished with school and casually said, “Why don’t you guys start a hard cider company?” and with that, they did. Tyler wrote his senior theses on hard cider at Bates College and then formed the company in April of 2011 before moving to Waterville, Maine in August (2011). Tyler and Ross then began traveling abroad and trying ciders from around the world to figure out what they liked and didn’t like, and what they were looking to make. After realizing how much cider in the United States lacked fresh apple juice they decided to make cider with real apple flavor, not the “natural flavorings” and “essences” that are commonly used. 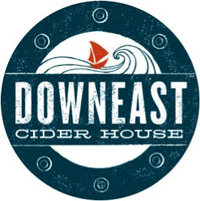 Downeast Cider House is committed to using only fresh pressed juices and pure, natural ingredients in their cider, including ale yeast instead of the more regularly used wine or champagne yeast. Original Blend - Described as their “foundation,” this blend is the result of hundreds of test batches and freshly pressed local apples. Using a secret blend of Red Delicious, McIntosh, Cortland, and Gala apples, along with flavorful ale yeast. The Original Blend is straight down the middle, not too dry, not too sweet. It has a decent body and is unfiltered. 5.1% ABV. Cranberry Blend – This interesting twist on Original Blend uses dried cranberries and cranberry juice to craft this sweet but satisfying cider. 4.9% ABV. Both ciders are gluten free and are available on tap and in 12oz cans. As for now, Tyler says, "The cider house is constantly changing: new equipment, new people... one thing we're looking forward to doing is producing more of our current ciders and starting production on new ciders." Tyler, Ross and the whole team at Downeast Cider House is definitely doing something right to achieve the “30 Under 30” honor. Congratulations! 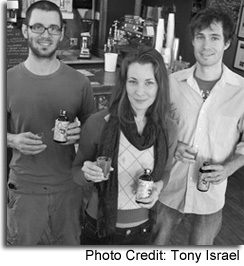 For more information on Downeast Cider House or to find their ciders, visit DowneastCider.com.